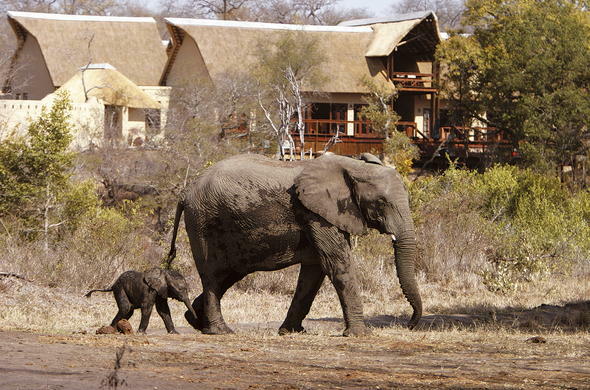 Elephant Plains Game Lodge offers excellent game viewing opportunities and luxury South African safari lodge accommodation in the heart of the African bush. This South Africa safari lodge offers guests friendly hospitality and comfortable accommodation in the game-rich Sabi Sand Game Reserve in the Greater Kruger Park, South Africa. Guests can choose from a range of accommodation to suit their needs. Discover the area's diverse fauna and flora during a game drive, and perhaps even spot the Big Five. Game drives are offered in the morning and evening, when guests have the opportunity to spot nocturnal African game. Guests can also participate in guided bush walks. Unwind with a soothing spa treatment at the African Health Spa or cool off in the swimming pool. The wooden deck overlooks a waterhole and is ideal for casual game viewing.